Indonesian Shutter-bug Monkeys shoot Themselves! When photographer David Slater turned his back on his photo gear while shooting wildlife in Indonesia’s Sulawesi National Park, he never expected that the local crested black macaques would take over the shoot. But they did. Or did they? Some doubt it. Slater insists that the photos are genuine, but does admit to rotating and cropping them for effect. 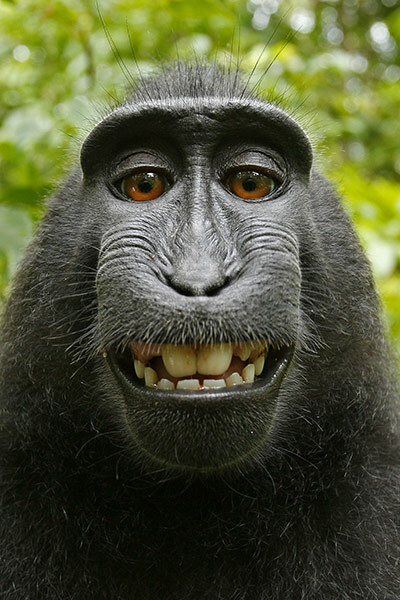 Expect these photos to show up in a camera marketing campaign soon: “So simple a Monkey can use it” via Guardian UK. More here. This entry was posted in ANIMALS: Human and otherwise..., Indonesia, Photography, Strange News, Travel and tagged Camera, Culture, David Slater, Indonesia, Macaque, Monkey, Photography, Self-portrait, Sulawesi. Bookmark the permalink. I’m a little skeptical as to how real these photos are. A little skeptical is a good attitude towards many things, IMO. It will be interesting to see if what direction the story will take.